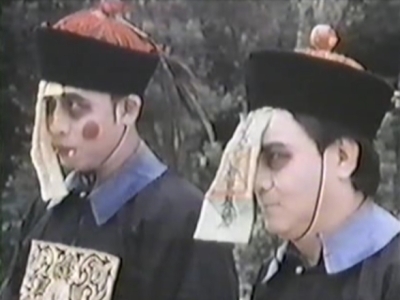 Believing in the commercial power of the hopping vampire on screen, combined with ninjas or not this was Tomas Tang's concept as he sold several movies internationally. Whether shooting stretches of their cut and paste formula mostly themselves in the case of Robo Vampire or letting the source movie dominate mostly in the case of Vampire Raiders: Ninja Queen, there is a delight present here as all these contrasting genre-images, ideas and footage goes into the cut and paste-blender. Merely because of the feel. Not because of quality cinema. That the content dictates ninjas and hopping vampires occupy the same frame and plot is no biggie for a Filmark brew and it's somewhat irresistible that they just present that to us without any pure motivation as to why. Perhaps not needed either because of the movie it's shooting wraparound scenes around, Mixed Up clearly isn't taking itself seriously either with this group of girls (and later male friends) being a goofy gang. While there are ghostly apparitions that are done within nighttime atmosphere, ultimately it's a comedy whose plot isn't entirely identifiable. It seems Filmark worked it over to a distinct degree as we scratch our heads as to WHY there's a horror element in the original in the first place. A sign of editorial, written and dubbing work being put forth and they even re-cast Ho Pak-Kwong, To Siu-Ming and Yue Tau-Wan from Mixed Up to craft the illusion of one, new movie. All these cute shenanigans gets tiring pretty quickly though. Mainly because there's no comedic vision or direction given to the group and an extended scenario on a boat post hour one is at times hideously drawn out because it doesn't register on the horror, comedy or horror-comedy radar. Filmark's footage is fun because of the conceived content, although stilted, expository dialogue and direction can't save them. 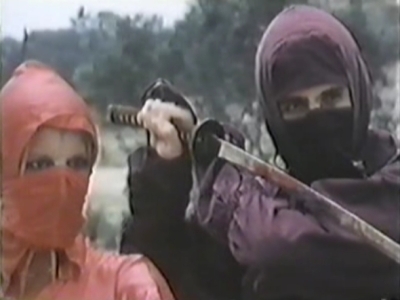 Better energy is present in the action scenes with both Grant performing admirably on her own but mainly the show belongs to the stunt doubles as now the ninja fight-scenes take on a faster, more fluid approach. Plus, you have the treat of a varied and long Filmark-finale where a variety of powers are showcased, in a few different settings and there's precious little to complain about when the enemies are decapitated heads of the hopping vampires. These are the actual quality sections while the rest, Mixed Up or the new scenes, struggle to make an impact. But the company that put the final product in a bow and sent it out get an overall pass and chuckle from the viewer because of the insistence of contrasting elements.